Shaidar Logoth are a band from Minnesota that plays an ambient form of black metal and this is a review of their 2015 album "Chapter II: The Ritualist" which was re-issued in 2018 on vinyl by Sentient Ruin Laboratories. Militant drum beats start off the album along with some dark soundscapes before going into a heavier musical direction while spoken word parts can also be heard briefly as well as the faster sections of the songs also bringing in a great amount of tremolo picking and blast beats which also gives the songs more of a raw feeling. At times the music gets very dissonant while the vocals are mostly grim black metal screams that are somewhat buried underneath the chaos along with all of the tracks being very long and epic in length as well as the songs also bringing in a great mixture of slow, mid paced and fast parts and at times the music also brings in elements of ambient and drone and synths and clean playing are also utilized briefly and as the album progresses demonic growls and melodic guitar leads are also added into the music. Shaidar Logoth plays a style of ambient black metal that is very guitar driven raw and dissonant sounding, the production sounds very dark and raw while the lyrics cover darkness, despair, hatred and wheel of time themes. 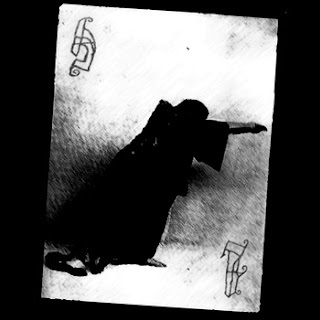 In my opinion Shaidar Logoth are a very great sounding raw and dissonant black metal band and if you are a fan of this musical genre, you should check out this re-issue. RECOMMENDED TRACKS INCLUDE "The Scourge" and "A Realm Befitting His Majesty". 8 out of 10.